Since the tragic shootings at Emanuel AME Church in 2015, Confederate memorials, including the Calhoun Monument in Marion Square, have come under increased scrutiny. In this lecture drawn from their new book, "Denmark Vesey’s Garden: Slavery and Memory in the Cradle of the Confederacy", Drs. 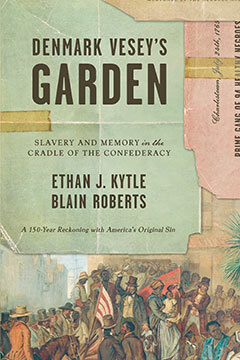 Blain Roberts and Ethan Kytle will explore the history of Charleston’s two Calhoun monuments and the resistance that they have provoked from the 19th century until today. Books will be available for purchase, and a book signing will follow the discussion. For more information about the book, visit https://thenewpress.com/books/denmark-veseys-garden.